This upscale resort is located in the exclusive area of Puerto Banús, on the famous Golden Mile, very close to the beach and some of the most exclusive shopping and leisure facilities in Europe. The resort features 200 guest rooms with fabulous views of the sea, the mountains or the hotel gardens, outdoor pools, a variety of dining options and a Wellness Area. 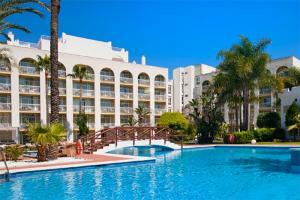 Located on the beach, approximately three miles from the centre of Marbella.